How to add additional administrators to your account. You can assign administrators to the following roles. 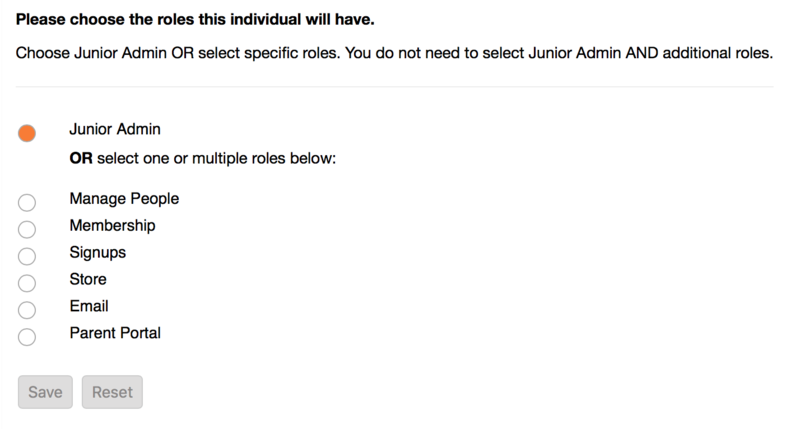 With the exception of the Junior Admin role, all roles are related to the menu functions. A user can be assigned to one or many roles. Junior Administrator - this role has access to all features with the exception of 3 functions under Account Settings. These include Profile & Billing, Admin Users and Graduation Request. Manage People - Can create and modify Family and Faculty records, modify Class Rosters or accept New Families under People. Membership - this role can record and report on membership activity. Signups - this role can create Events and Activities, assign and report on parents that have signed up. Store - this role can manage your store, record and report sales and update membership. Parent Portal - this role can edit Parent Portal Setup as well as manage Portal Accounts for parents and faculty. Your first view includes a listing of all existing account administrators. If this is your first time adding, this list will be empty. Click on the Add Administrators button to add a new admin user. Select a role or roles for the person you are granting access. Enter their name and email address, then Save. An email will be automatically sent notifying them they now have access to the admin portal. If they have no other access to the system, the email will include a temporary password. If this parent already has a parent portal account for your school's system, then this process will add their admin privileges to their existing account and login credentials.